Grey water is defined as “wastewater that is produced from household processes (e.g. washing dishes, laundry and bathing)” (Carden et al, 2007). There is a high volume of grey water produced in informal settlements with the expected average nearing 70 liters per day per household. Grey water can contain harmful bacteria and even faecal matter that contaminates soil and ground water. When coupled with the relatively high water table of many settlements, flooding in the winter rainy season often occurs, spreading this contaminated water. In order to address these issues our team explored methods of managing the flow and improving the quality of grey water with the hope that future testing will allow the reuse of grey water. This is especially important considering that the City of Cape Town is expected to face a water shortage by 2012 (Cape Times, 2009). The designs for grey water purification include an initial collection tank that then runs into two biofilters for purification. Wetland plants will be grown in the biofilters to absorb some water and also be used as a carbon source for composting. After purification, the water is channeled to soakaways. Source: Grey water from on-site taps, hand washing station, and laundry station. Maintenance: Replant gardens and clean gravel annually. Valve Control: Valves will be used to control the flow of grey water. On sunny days the valve can be closed to fill the biofilter with water for evaporation. On rainy or cloudy days the valve can be open and spill water to soakaways. Biological methods for treating grey water are quite experimental, and a systematic way of determining the most effective methods has yet to be created. 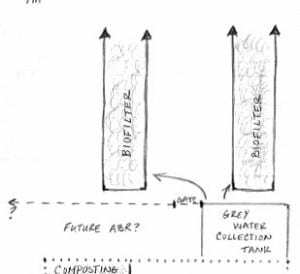 Therefore, in order to prevent our system from contaminating the surrounding soil, we have designed a dual flow tank that will simultaneously help us monitor the volume and quality of grey water collected. The figure below details the basic principle of a biofilter like that used in our Sanitation Centre designs. The grey water is collected in a traditional septic tank or a covered bark mulch pit and then directed into the gravel trickling filter by a perforated pipe. This gravel hosts natural microorganisms that break down harmful bacteria before recollecting in a secondary tank. This tank will allow easy access for testing purposes, and a failsafe collection point if the volume of water is higher than expected. The final step at this time will be a pipe directing the treated water to multiple planned soakaways. In the future, after extensive testing for pathogens and other contaminants, this pipe might direct the clean water back into the facility for controlled reuse.